It’s sort of a primitive view of evolution, particularly of evolution working in reverse, and people falling from grace becoming more ape-like. This isn’t particularly accurate to the theory of evolution as proposed by Charles Darwin, but it was and still is a popular misinterpretation. I suppose humans COULD become more ape-like again, IF there were some environmental advantage that led to the ape-men thriving and reproducing. But to say that’s evolution in reverse is assigning a value judgement to a natural process. Much the same thing occurred in the earlier The Water-Babies, a fictional work that combines evolution with Christian themes, where lazy people devolve into apes. And it plays into the abhorrent notion of racial evolution, that different races evolved separately and have significant physical and mental differences. While Howard’s Conan stories were mostly all white European affairs, there’s a lot about race in the essay, and not just in the sense of black and white, but in racial differences among Caucasian peoples. His sympathy to the barbarians means that his describing an ethnic group as more civilized isn’t necessarily meant to be a good thing, but it’s still kind of racist. This Wikipedia article discusses Howard’s views on race, basically saying that he wasn’t especially racist for a white American writer of his time and that he became less racist over time, but his works certainly weren’t free from that sort of prejudice. I get the feeling that a lot of people didn’t even really think about it. I’ve looked at the connection to Theosophy, intentional on Howard’s part from what I’ve heard, and part of Theosophy was that humanity was descended from several different root races. L. Frank Baum, who was also quite interested in Theosophy, referred to the Mifkets in John Dough and the Cherub as sort of a missing link between animal and human, and the King says he thinks the Arabs might be descended from Mifkets. And in Rinkitink in Oz, both Tottenhots and Mifkets are described as “lower forms” of humanity. I previously mentioned the similarity between Howard’s and J.R.R. Tolkien’s views of prehistory as similar, centered on the rise and fall of physical landmasses as well as civilizations. It’s not clear whether Tolkien was directly influenced by Theosophy, although I have read that he liked the Conan stories, so maybe he was indirectly influenced by way of Howard himself. Really, though, I get the idea that, in the days before plate tectonics became accepted science, great cataclysms sinking entire continents and creating new ones was pretty commonly accepted anyway. Of course, there really ARE sunken lands, but not to the extent proposed with, say, the continent of Lemuria. The lack of knowledge of plate tectonics helps to explain why the mountains of Middle-Earth don’t make geological sense. 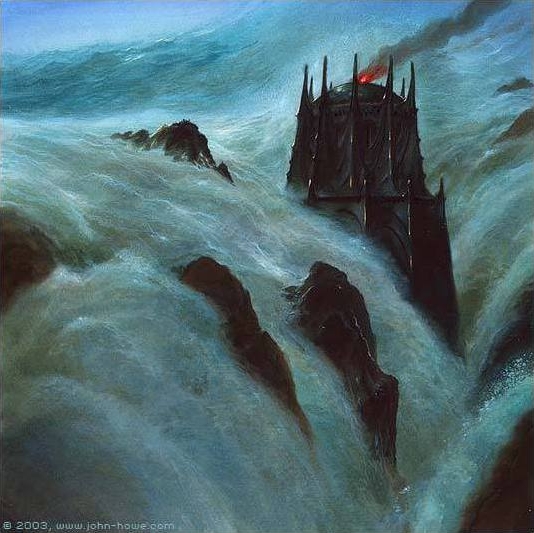 Of course, if the world was created and changed by intelligent beings, it wouldn’t necessarily have to make sense; and Tolkien’s explanation for the destruction of Atlantis (AKA Numenor) had to do with humans being misled by a fallen angel into seeking immortality, an example of moral concerns affecting geographical ones. There’s also divine consciousness involved in the origins of humans, Elves, and Dwarves; they were all created, instead of evolving. 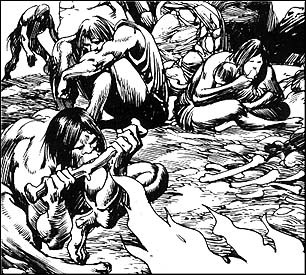 As such, racial evolution doesn’t really play a part, although there is the similar idea of fallen Elves becoming Orcs. 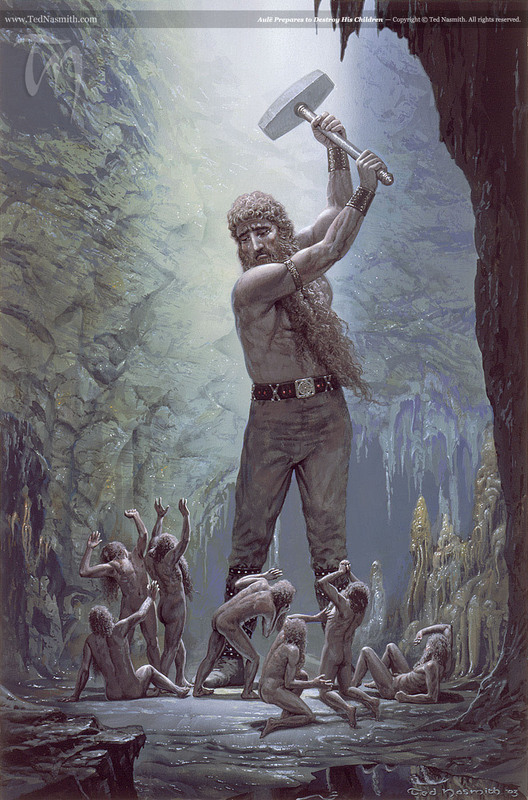 Aulë, the Vala who creates the Dwarves, is identified as a smith. While Baum didn’t deal much with religion in his fantasies, he occasionally referred to God as the Supreme Master or Supreme Maker, suggesting a craftsman of sorts. I believe Howard described himself as an agnostic, and most of his gods seem to be either hands-off or malevolent, not necessarily the sort who’d be concerned with creation. His works were tied in with H.P. Lovecraft’s, which tended to portray gods as horrific extraterrestrial beings, and Howard used some of that, as well as euhemerism with the deification of the Hyperborean chief Bori. The worship of Mitra is described as generally positive, but with exceptions. Named after the Persian deity who had a mystery cult in Rome around the same time as the rise of Christianity, the religion is roughly equivalent to the Christian faith, based on simplicity, forgiveness, and missionary activity. 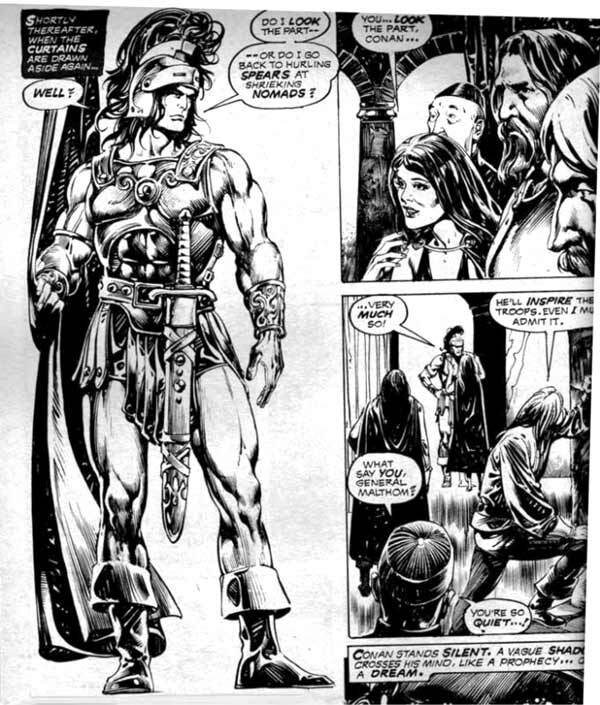 Conan becomes a general after Yasmela, a worshipper of Mitra, obeys the god’s directive to place the kingdom’s fate in the hands of the first man she meets, who is Conan. There appears to be a parallel to Emperor Constantine adopting Jesus as a patron deity in order to win a battle and subsequently converting to Christianity. 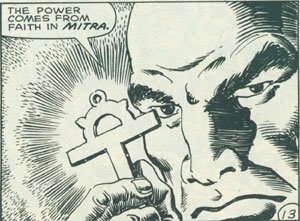 Still, I don’t know of any indication that Mitra was supposed to be all-powerful or to have created the world; he was just a more beneficent deity than his fellows. I’ve noted before that agnostic and atheist fantasy writers often do include gods in their writings, but these gods tend to be ineffectual and/or have their own agendas that don’t necessarily line up with those of humanity. That’s generally the case, for instance, with Terry Pratchett’s Discworld books, although it changes a bit as the series progresses from more of a general sword-and-sorcery parody where most myths are true to more of a humanistic fantasy world. The idea of lightning being hurled by the gods goes from “proven meteorological fact” in The Colour of Magic to being still true but not strictly necessary in Small Gods, in which gods are described as being wholly dependent on human belief. The Creator of the Discworld is a contractor who isn’t considered a god, and there’s a God of Evolution in The Last Continent who is particularly fond of beetles but doesn’t understand how reproduction works. I think a recurring theme is that whether gods EXIST isn’t the issue so much as whether humans need to believe in them in order to function, and Pratchett’s answer isn’t necessarily always no. 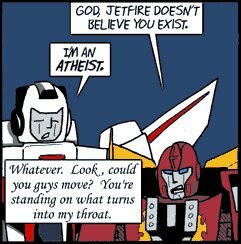 The thing is, as religious fans of less devout fantasy will point out, the existence of bumbling, or at least limited, gods doesn’t negate the possibility of an all-powerful, all-knowing, all-loving one. But at least for me, they lean in that direction, the stealth message being essentially, “You can dismiss or even laugh at these gods, but is yours really that much different?” Obviously your mileage may vary on that point. This entry was posted in Authors, Christianity, Discworld, Evolution, History, Humor, J.R.R. Tolkien, L. Frank Baum, Magic, Maps, Monsters, Mystery Cults, Mythology, Norse, Oz, Oz Authors, Persian, Prejudice, Religion, Roman, Science, Terry Pratchett, Theosophy and tagged agnosticism, angels, atheism, atlantis, aule, bori, cataclysms, charles darwin, charles kingsley, conan the barbarian, devolution, dwarves, elves, emperor constantine, god of evolution, h.p. lovecraft, hyborian age, hyperborea, john dough and the cherub, lemuria, middle-earth, mifkets, mithra, mitra, numenor, racial evolution, racism, rinkitink in oz, robert e. howard, small gods, the colour of magic, the last continent, the water-babies, tottenhots, valar, yasmela. Bookmark the permalink.